This year, Lenovo had the honor of unveiling Motorola's newest flagship offerings. These flagship offerings are the Moto Z, which aims to succeed the Moto X, and the Moto Z Force, which is a bigger and badder version of the Moto Z. The Moto Z Force is aimed at succeeding last year's Droid Turbo 2 (exclusive to Verizon in the US, Moto X Force in worldwide markets). Both the Moto Z and Z Force are identical in height and width, and their thickness is the only way to tell the two apart. The other difference with the Moto Z Force is the significantly larger battery, the added girth that comes with a larger battery, a higher resolution 21MP camera, and the shatter proof screen that will survive drops of up to 5 feet onto flat surfaces. These specs make the Moto Z Force a worthy competitor to the recently reviewed Samsung Galaxy S7 active. The Moto Z Force will remain as a Verizon exclusive model in the US and for now. As of this review, there are currently no plans to release the Moto Z Force outside of the US. Making it like the Samsung Galaxy S7 active which remains as an AT&T exclusive and is not available anywhere else in the world. 21MP camera, f/1.8 aperture, 1.12 micron pixels, OIS, laser autofocus, dual-tone LED flash. 1080p video @ 30 or 60fps, 4K @ 30fps. The Moto Z Force is a worthy competitor to the Samsung Galaxy S7 active as they both play fine with water (Moto Z Force is splash resistant only), they both offer shatter-proof displays, and they both are touted as ultra-durable devices with large batteries. We've already reviewed the Moto Z, but the Moto Z Force is aimed at a slightly different consumer, but mostly the power user. 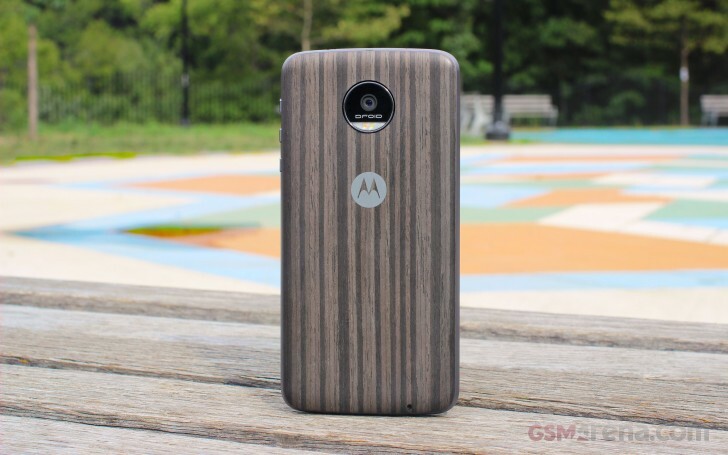 Paired with the US' best (although, most expensive) carrier, the Moto Z Force Droid also carries a $96 premium over the Moto Z Droid when purchasing from Verizon. The Moto Z Force takes on the Moto Z by offering a larger batter, higher resolution 21MP camera, and the aforementioned shatterproof display. We are curious to see if Lenovo has changed the recipe for creating their shatter-proof display. The previous iteration of this screen, which we saw in the Droid Turbo 2 and Moto X Force had diminished viewing angles, and the plastic-based display lens was more prone to light scratches. The Moto Z Force works with the same Moto Mods as the Moto Z. Both it and the Moto Z Force have otherwise identical hardware on the exterior, except for the thickness. The Moto Z Force is 25% thicker than the razor thin 5.2mm Moto Z, but it's still quite thin. Camera performance with the Moto Z was decent, and we are expecting the 21MP camera found in the Moto Z Force to be even better. Follow us onto the next page to see what's inside the Moto Z Force's retail package.